As Americans rush to annuities as one of the few safe places to put their money, key carriers are closing the door, leaving producers scrambling to place more business with fewer companies able to take it. Aviva, the top carrier for independent producers, started rescinding appointments and cutting production for the year, according to independent marketing organizations (IMOs) who received cancellation notices by phone in mid-March. IMOs were told Aviva was dropping their appointments effective immediately, said one IMO principal who had to send business back to agents. That principal also said the carrier was cutting the number of IMOs to about 15, down from about 50. In a statement to InsuranceNewsNet, Aviva said: "On a daily basis we write millions of dollars in new annuity business, and we will continue to do so over the long term. We do plan to moderate our growth in 2009. To do this, we have streamlined our distribution channel, and ended relationships with some independent marketing organizations (IMOs), while continuing to invest in relationships with other IMOs. Other carriers have stopped accepting appointments but have not yet rescinded them. Sammons Financial Group, which owns both Midland National and North American, "temporarily" stopped accepting annuities appointments as of March 16 but is still accepting them for life insurance. The company is also raising the minimum premium to $20,000 and has lowered the maximum to $1 million per annuitant. Sammons did not return a request for comment. Consumers are bearing the brunt of the cut because the reduction of annuities supply is coming just as the market had its best year in 2008. While other insurance products slumped, particularly in the fourth quarter of 2008, annuity sales boomed. Fixed annuity sales in the fourth quarter rose 34 percent over the record-breaking third quarter, bringing the quarter up 90 percent over the last quarter of 2007, according to Beacon Research. The year ended up 60 percent over 2007. In the meantime, new annualized premium for individual life insurance dropped 14 percent in the fourth quarter of 2008, ending the year with an overall 7 percent decline, according to LIMRA. The quarter's decline was the sharpest since 1951, and the year's drop was the steepest one-year decline since LIMRA started keeping records. 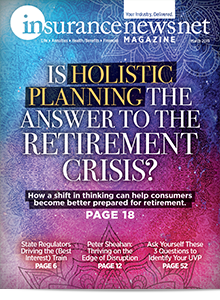 "Millions of retired and soon-tobe- retired Americans are frightened about their financial future and want to turn to safety," said Matt Neuman, vice president of marketing at Advisors Excel, a field marketing organization (FMO) in Topeka, Kansas. "And for the first time in the history of our industry, supply of the products they demand may not be there." 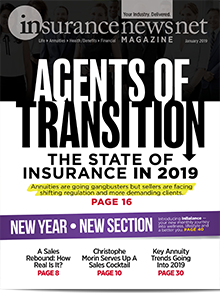 The demand for annuities in this year's first quarter is apparently building on last year's momentum, because carriers are concerned they will hit their annual production goal early in the year. 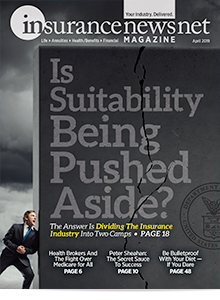 "Insurance companies price to sell a certain amount of annuities for the year," said Sheryl Moore, president of Advantage Group Associates, an indexed annuity analyst. 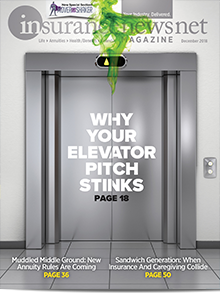 "Demand is causing some companies to take measures to stay in line with their original pricing projections. Measures that companies are taking include: terminating producer contracts, not accepting future producer appointments, lowering commissions, canceling incentives, raising minimum premiums on annuities and the like." Producers are going to have some difficulty finding companies to take their business, Moore said. "When key companies cut back, other carriers will not be able to make up for it," she said. Carriers are also targeting annuities, because they are more "reserve-intensive" than life products, said Jack Marrion, president of Advantage Compendium, also an annuities analyst. Companies need as much as $1.06 on hand for every dollar of cash value because of more immediate payout requirements than life products. The Securities and Exchange Commission's Rule 151A is another factor, Marrion said. If the rule survives court challenges, it will treat indexed annuities as securities starting in 2011. "That has companies really looking at selling through the B/D channel," Marrion said. "And they want to make sure who they have on board is worth the additional compliance requirements." Aviva's cuts in production and appointments came at the same time A.M. Best announced a financial strength downgrade from A+ (superior) to A (excellent) with a stable outlook. A.M. Best said defaults and impairments to Aviva's holdings led to the downgrade. It also criticized Aviva's decision to maintain its dividend payments in 2008 as eroding its underlying capital. Other insurers have cut or eliminated dividend payments. Publicly traded companies such as Aviva have been slammed in the markets. The Dow Jones Wilshire U.S. Life Insurance Index dropped by more than half this year and more than 80 percent since its all-time high in 2007. The plummeting stock values hurt companies' capital just as doubts are growing about those companies' own investments. Mortgage-backed securities are among the more troubling risky investments companies made in an effort to at least maintain returns that shareholders demanded. "Everybody has a quarterly outlook, and they punish the hell out of someone who had a bad quarter," said Edward E. Graves, an American College insurance professor. Mutuals have escaped the pressure and can look longer term to retain stability, many secure in their AAA ratings. 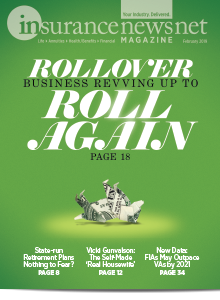 "They stayed out of the rat race of having to report every quarter," Graves said. Each quarter, public companies have "producers are going to have some difficulty finding companies to take their business." Sheryl Moore, President Advantage Group Associates to report a current market value for their holdings in what is known as markto- market accounting, which became accepted in the 1980s. The plummeting values make it even more difficult for insurers to satisfy their risk-based capital requirements. That has led some to push for help from the Trouble Asset Relief Program (TARP). Most insurance companies don't qualify for the federal TARP because they are state-regulated, unless they have a bank under their umbrella. At least a dozen carriers, at the urging of the federal government, acquired thrifts to be eligible for the money. But as of mid- March, they still have not heard if they will get any funding even though federal offi- cials keep saying they will follow through very soon. The American Council of Life Insurers has said companies can expect to hear about it by the end of March. The Hartford Financial Services Group, whose stock value plummeted from a high of 105.35 in 2007 down to 7.04 on March 14, already had a $2.5 billion infusion from Allianz in October after a bruising third quarter. Graves of The American College said a TARP infusion can help companies if they are doing it for the right reasons, such as shoring up reserves. "Some might not even need the money," Graves said. "They might be asking because if someone else gets it, they don't want to be at a disadvantage. Others might use it to buy another company." That would not sit well with a public already fed up with news of misspent TARP money, he said. But beyond that, Graves said he was confident companies are doing what they need to for longterm survival. Graves also said this period might restore stability to financial markets, including the insurance sector. It might be the beginning of rebuilding trust with the American consumer after the financial shenanigans that led to endless meltdown. "It was lunacy what was going on," he said. Carriers will survive the craziness but Graves said he was concerned how well producers will do. 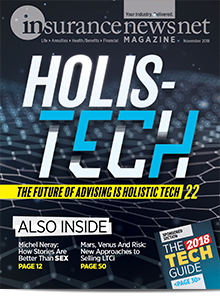 Insurers will find the right balance to stabilize their ratings and preserve profitability, but some of that will be at the expense of the sales force. "Companies are cutting the least painful to them by severing the arm," Graves said. "The farther distance you are from the home office, the more likely you are to get cut. Agents have to assess where they are and protect themselves.